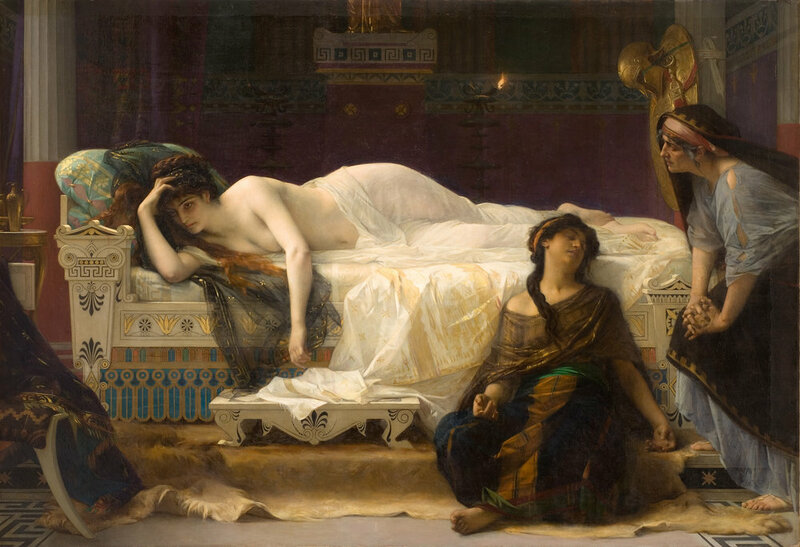 Painting by Alexandre Cabanel. Phèdre. 1880. Valentine’s Day is just around the corner. For some of us, it’s a great day to celebrate all the meaningful relationships in our lives, romantic as well as platonic; for others, it is a dreadful, commercialized holiday and a day to spend in the comfort of our home, watching horror movies (I have been both of these people). However, Valentine’s Day is also unfortunately a day to dwell on relationships that have come and gone from our lives. People can argue endlessly about whether or not The Great Gatsby is a love story, but what matters is that Jay Gatsby lives it as such. As a young soldier, he fell in love with Daisy in 1917, before being deployed overseas; when he returns, Daisy has married Tom Buchanan, a wealthy "brute of a man," who is already having an affair with another woman when the story begins. This does not stop Gatsby, who will try his best to win Daisy back, and doing so, try to erase the past standing between them. This delusion will ultimately be his downfall, but who hasn’t wanted, for one moment, to ignore the complexity of the present for the faded sweetness of past loves? On the contrary, if you want an example of a friendship with an ex done right, look no further than Patricia Highsmith’s classic novel The Price of Salt (also known as Carol). Carol, the object of the young heroine Therese’s affection, has had a short-lived romantic relationship with her best friend Abby years before the plot unfolds. The two, however, remain close friends and Abby’s support is key to get Carol through the struggles she faces as her new love story unfolds. All of this is to say that if you chose to remain friend with you ex, you must remember three things: put yourself and your needs first; take all the time you need to rebuild a new relationship; and don’t bet with your ex on the new lover you plan to seduce. Just don’t. And before Swann had had time to understand what was happening, to think: "It is the little phrase from Vinteuil's sonata. I mustn't listen! ", all his memories of the days when Odette had been in love with him, which he had succeeded, up till that evening, in keeping invisible in the depths of his being, deceived by this sudden reflection of a season of love, whose sun, they supposed, had dawned again, had awakened from their slumber, had taken wing and risen to sing maddeningly in his ears, without pity for his present desolation, the forgotten strains of happiness. In place of the abstract expressions "the time when I was happy," "the time when I was loved," which he had often used until then, and without much suffering, for his intelligence had not embodied in them anything of the past save fictitious extracts which preserved none of the reality, he now recovered everything that had fixed unalterably the peculiar, volatile essence of that lost happiness; he could see it all; the snowy, curled petals of the chrysanthemum which she had tossed after him into his carriage, which he had kept pressed to his lips, the address 'Maison Dorée,' embossed on the note-paper on which he had read "My hand trembles so as I write to you," the frowning contraction of her eyebrows when she said pleadingly: "You won't let it be very long before you send for me? "; he could smell the heated iron of the barber whom he used to have in to singe his hair while Loredan went to fetch the little working girl; could feel the torrents of rain which fell so often that spring, the ice-cold homeward drive in his victoria, by moonlight; all the network of mental habits, of seasonable impressions, of sensory reactions, which had extended over a series of weeks its uniform meshes, by which his body now found itself inextricably held. I love this one because even though it takes place more than a hundred years ago, in a society that is foreign to most of us, it is highly relatable. One major theme in In Search of Lost Time is that there are two types of memory: an active, conscious memory, or "intelligence," and a passive, sensorial, and often more powerful memory. This is what the madeleine episode at the beginning of the first book is all about: tasting the cake, the narrator is thrown back to his childhood. In Search of Lost Time presents many other episodes like this one, and the episode of Vinteuil's sonata is especially poignant. Many of us have experienced it first hand: unexpectedly hearing a song that reminds us of a lost love, we do not only recall the relationship, we relive it. A great mystery in heartache is to realize that although it feels like the world is ending, almost everyone is familiar with it. If the pain is so great, shouldn’t have someone figured out a solution by now? An epidural for feelings? Let’s be honest: poetry is not as effective as the imaginary emotional pain killer that I have in mind, but it is soothing to realize that others have been through the agonizing sorrow we’re going through, and lived to put the words on the page. I can only find her again in my sleep or in her death; in both, she has forgotten me. Rebecca is built on a gimmick: a recent widower, Maxim de Winter, meets the young narrator on holiday in Monte Carlo. They marry after having known each other for a few weeks, and after their honeymoon, he brings her back to his magnificent estate of Manderley. The narrator then realizes that, even though she’s dead, the late Mrs de Winter is very much present in everyone’s minds. Most importantly, even though readers are subjected to the omnipotent presence of her name, Rebecca, they are never to learn the name of the narrator. This modern gothic novel has been a best-seller since 1938 for a reason: it gives a fantastical twist to the feeling that the past lovers in our life are forever here to stay, their phantom-like presence always affecting our present relationships. It is only fair to talk about one of the patron saints of the Attic – the mad woman in the attic herself. Daphne du Maurier’s Rebecca was largely inspired by another classic gothic novel — Jane Eyre. It is no coincidence that both novels have a great character in common: the evanescent ex. In Jane Eyre, Mr Rochester meets his first wife Antoinette Cosway, a Creole heiress, in Jamaica — the story of their meeting and marriage is brilliantly explored in Jean Rhys’s retelling, Wide Sargasso Sea. However, when Jane Eyre enters the life of Rochester, she is completely ignorant of his first wife’s existence. Driven to madness shortly after her wedding, Antoinette was locked away in her husband’s attic. She finds her way out to roam the estate at night, however, and goes as far as to set Rochester’s bed on fire. Her pyromaniac tendency will eventually lead her to destruct the entire estate and maim her husband. She is herself killed in the fire. This tragic story — one could hardly call it a love story — lets the reader explore the darkest aspects of past relationships, the dreadful acts ex-lovers are capable of undertaking in order to make each other suffer. This figure of the monstrous ex can be traced back as far as the myth of Medea. In both cases, of course, the contemporary reader recognizes that the true monster is the man that caused the madness in the first place, and this is why feminist retelling of classic stories are so important to restaure the humanity of these past-lovers. Dumas did not invent the character of the femme fatale, but he wrote one of its most iconic incarnations in literature. When d’Artagnan meets him, Athos is a common musketeer and Milady de Winter (maybe related to Maxim, I don’t know) is the devilishly seductive spy of the Cardinal de Richelieu, the musketeers sworn enemy — so you can imagine the strength of the coup de théâtre when d’Artagnan, and through him, the reader, realizes that Athos was once a noble man, the Comte de la Fère, and married to a woman named Anne de Breuil, whom he would later come to know as Milady. As they are hunting in the forest one day, Anne faints and Athos has to undress her to let her breathe. Doing so, he finds the fleur-de-lis symbol branded on her shoulder, the mark of a convicted criminal. Feeling betrayed and dishonored, and, as the local seigneur, having the right to dispense justice on his estates, Athos immediately orders that she’s hanged from a tree — but this condemnation is to haunt him for the rest of his life. Of course, to a contemporary reader, Athos’s attitude toward his wife is appalling, and Milady de Winter appears as one of the great mistreated villains in literature, but she is also the archetype of the evil ex, the one that won’t even let death come between you, and that will hunt you to the ends of the earth to keep on making you suffer. From the moment he received the Booker Prize in 1989 for The Remains of the Day, Kazuo Ishiguro has been the great contemporary writer of the should-have-been and the might-have-been, and every shade of regret in between. He is also wonderful at describing dissolving relationships. Nocturnes is a mesmerizing collection of short stories; like its title poetically suggests, each story centers around music and nightfall. Ever the romantic city, the first one is set in Venice. A fading American singer plans a come-back, and in order to stage it, decides to serenade his wife and their dying relationship one last time before moving on with his life. No list about the great exes in literature would be complete without at least a book that explores the complexity of the break-up itself. Sometimes, it is but a moment, but often, it is a process, and a long, painful one at that, full of doubts and regrets, leaving the two parties alone to wonder where and why things went wrong. “That's what I loved you for, that you are generous at heart! (…) Love is over, Mitya!” Katya began again, “but the past is painfully dear to me. Know that you will always be so. But now let what might have been come true for one minute,” she faltered, with a drawn smile, looking into his face joyfully again. “You love another woman, and I love another man, and yet I shall love you for ever, and you will love me; do you know that? Do you hear? Love me, love me all your life!” she cried, with a quiver almost of menace in her voice. So they murmured to one another frantic words, almost meaningless, perhaps not even true, but at that moment it was all true, and they both believed what they said implicitly. I love this passage so much because it recognizes the most beautiful and terrible thing about the exes in our lives: we once shared something precious, and even though that something is over, and no matter the reasons why things didn’t work out between us, the love we shared is still a part of us, and always will be. Now tell us, who are your favorite exes in literature?